We Rock The Spectrum, a popular gym that provides a safe play space for children – including kids on the spectrum, reopens under new ownership. 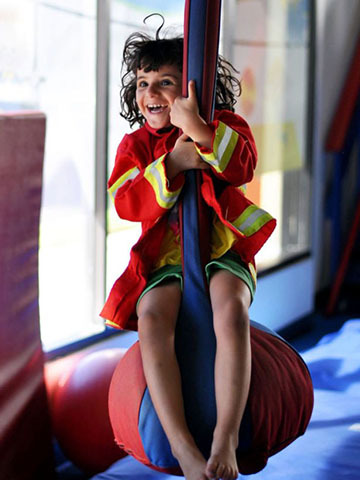 The bright and cheerful indoor gym, operated by new owner Kimberly Moore, offers fun, educational, and motivational activities for all children – but with a special focus on children with sensory processing disorders such as autism. For Moore, finding adequate services for children with special needs was one of those struggles and a motivating factor in her decision to purchase the gym. “It’s a place that you can drop off your little one for a few hours and have the peace of mind that the person watching your child understands them. I cannot think of a better business to raise my son around,” she says. The Williamsburg We Rock the Spectrum location offers a variety of exercise equipment, play areas, and learning opportunities that inspire – but not overwhelm the senses. Visitors are able to utilize suspended devices such as swings, a trampoline, climbing structures, crash mats and pillows, sensory-based toys, and an arts and crafts area – all to help improve core strength and balance, fine motor skills, auditory processing, and stress release. There’s even a zip line. Open Play, where children can explore the gym and interact with their parents and other kids, is available most days, and other activities such as Parents Night Out, birthday parties, and Character Days scheduled throughout the month. “Character Days are private events where kids can experience characters – like the Easter Bunny, in a non-crowded setting. This is important for kids on the spectrum,” she says. Community service and support is important to Moore who feels a special connection to the Historic Triangle. She was born and raised in Williamsburg and is a graduate of Bruton High School. She received her degree in Psychology from Christopher Newport University and has 12 years of local management experience. She is also a single mom. “It’s a blessing to now be able to bring Aiden to work with me and continue to work on the activities that he is currently focusing on in therapy,” she says. Curious moms and dads can meet Moore and tour the facility during the grand re-opening celebration held on Saturday April 6, 10am-5pm. The event will feature music, face-painting, raffles and more, plus refreshments provided by local businesses. This entry was posted on March 25, 2019 by David TEST! Ephraim.